The CD107a antigen is the heavily glycosylated 110 kDa lysosomal-associated membrane protein, LAMP-1. Together with LAMP-2, they are the mayor glycoproteins on the membrane of lysosome granules. 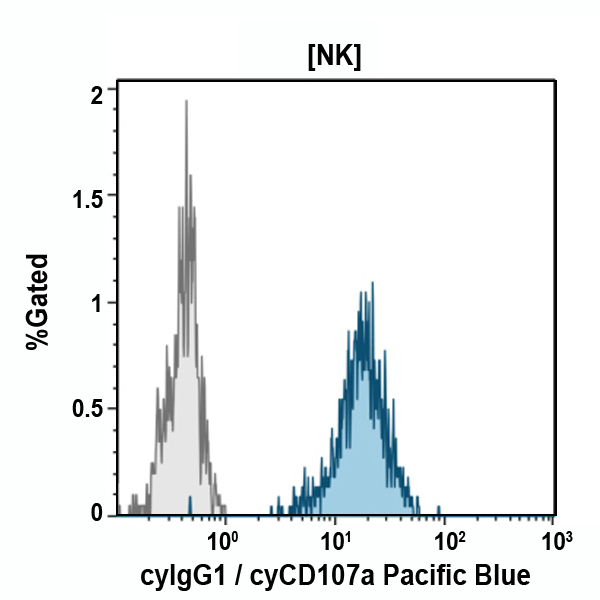 CD107a molecule is ubiquitously found as intracellular antigen. It is also expressed on the surface of activated platelets, PHA activated, a few monocytic cell lines, and fetal thymus stromal cells. It has been described as a marker of cytotoxic CD8+ Tcell degranulation and of NK cell functional activity. As platelet activation marker, it has characteristics of an adhesive molecule. A minor fraction (<2%) of LAMP-1 is associated with the plasma membrane of most nucleated cells, presumably as a result of selective exchange of lysosomal and plasma membranes. Increased surface expression of LAMP-1 has been observed on transformed cells of high metastatic potential, and on embryonic cells. *Alexa Fluor and Pacific Blue are registered trademarks of Molecular Probes, Inc.